Opening ceremony for the 7th Sino-India joint exercise Hand-in-Hand 2018, scheduled from 10 to 23 December 2018 was held on 11 December 2018 at Chengdu, China. Company size contingents of 11 SIKHLI from Indian Army and a regiment from Tibetan Military District of People's Liberation Army participated in the exercise. 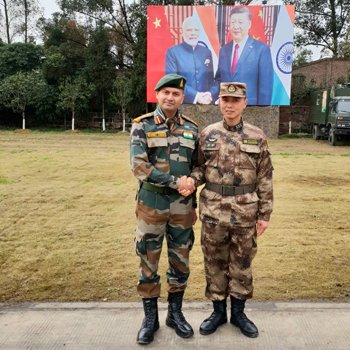 The Indian contingent was led by Col Puneet Pratap Singh Tomar, Commanding Officer, 11 SIKHLI, while the Chinese contingent was led by Col Zhou Jun. Major General Kuang Dewang, senior representative of joint training from PLA, reviewed the parade in presence of a number of officials from both the nations.